Each count, in the above screenshot, stands for a combination of apparel and color. Arranging the data in this format helps us in understanding the data in a better way. For example, we can quickly say that there are 2 people who are wearing a green colored pant and 5 who are wearing a yellow colored pant. We can also say that, in the given set of people, nobody is wearing a yellow colored shirt. If let's say that we had a few people wearing purple colored shirts/pants then we would have had another column to show this data. The important thing to note is that a Matrix report can grow both horizontally and vertically i.e. the number of columns and the number of rows are all decided at run time. 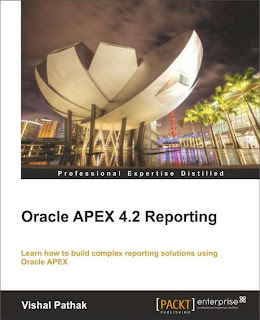 Let us now look at the various ways of creating a matrix report in APEX. We will talk about the following 3 ways of creating Matrix reports. Let me also share a screenshot of the Matrix report. Oracle 11g has a feature called Pivot operator. Pivot operator can help us achieve our objective. The only problem with this operator is that it has a static IN clause. Pivot XML can however use sub queries. Let me first talk a little about the Pivot operator. The basic function of a query using the Pivot operator is to aggregate the data based on the function written in its list clause and transpose the rows of the aggregated result as columns. The pivot operator has three clauses namely, the list clause, the for clause, and the in clause. The list clause describes the aggregation functions such as sum and avg. The for clause lists the columns which are to be grouped and pivoted. The in clause lists the columns which will appear in the output. Now the problem is that the in clause can only have a static list of values. The developer obviously, does not know the number of columns that will appear in the final result. The solution is to pass a page item as a substitution variable in the in clause. This page item can be fed with the right list of values on the fly and hence the arrangement give the same results as a dynamic in clause would. We will use the same item(P5_DEPT_LIST) in the in clause of the PIVOT operator and also in framing the column headings. Hence the data and the headings would always be in sync. Let me now share the query of the region source to make more sense of the discussion. Note that the number of columns in the result will depend on the number of values, stored as a list, in P5_DEPT_LIST page item. Hence the number of columns and their names will not be known at the time of coding. So, it is important that we check the Use Generic Column Names check box as shown below. Let us now look at the source of P5_DEPT_LIST. The source is pasted below for your convenience. listagg function, in the above code, aggregates strings. It lets us order our data using the order by clause and also allows us to supply a separator for the values in the list. Many more methods of string aggregation are discussed in the book. P5_DEPT_LIST is then passed as an argument to the in clause, as shown in the query shared above. Since the same item is used in the in clause and in column headings, the column headings and the data match perfectly. 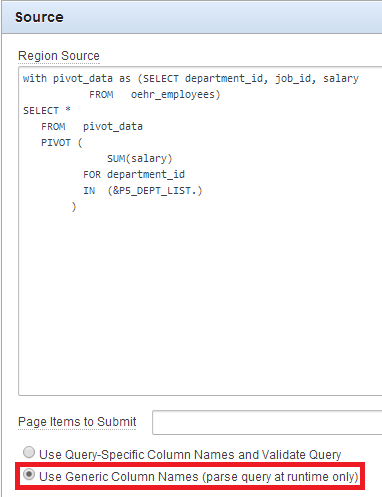 Check https://apex.oracle.com/pls/apex/f?p=81782:5:0::::: to see the implementation that uses PIVOT query with substitution string for generating Matrix report. We can also create Matrix reports using APEX's dynamic query region. Let us talk about it now. APEX has a feature that allows us to write a query string as the source of a region and APEX displays the data after running the query string. This type of region is called 'SQL Query (PL/SQL function body returning SQL Query)'. We can concat the query with P5_DEPT_LIST and get our Matrix report. This method does not use substitution strings. I am pasting the region source for your convenience. Check https://apex.oracle.com/pls/apex/f?p=81782:5:0::::: to see the implementation. Pivot XML query is another way of creating Matrix reports in APEX. Unlike the Pivot queries, Pivot XML queries let us put a sub query in the in clause. The trouble with these queries is that we get an XMLType as an output. We then have to extract meaningful info from this XMLType. Check https://apex.oracle.com/pls/apex/f?p=81782:5:0::::: to see the implementation that uses Pivot XML queries. The query of a region that uses Pivot XML is shared below for your convenience. extractvalue (department_id_xml,'/PivotSet/item[column/@name = "DEPARTMENT_ID" and column/text() = 110]/column[@name = "SAL"]') as "110"
The query written above uses extractvalue function on top of the data returned by the Pivot XML operator. To understand this query, we have to understand the format in which we get the data from the Pivot XML operator. The last section on https://apex.oracle.com/pls/apex/f?p=81782:5:0::::: shows the data returned by Pivot XML operator and the query that generates this region. I have converted XMLType to CLOB in the query so that the data is visible on the APEX application. Have a look at that data and note the structure of the XML to better understand the following discussion. Let me also share the screenshot of the XML returned by the Pivot XML operator for one of the job ids. Now, every item node has a pair of column nodes. These 2 column nodes have different values (DEPARTMENT_ID and SAL) for the name attribute. The column node with the DEPARTMENT_ID name tells us the column of the Matrix report to which the data belongs while the column node with the SAL name holds the data to be displayed. Extractvalue function uses this info to create the report. Let me now share the code of the extractvalue function. extractvalue (department_id_xml,'/PivotSet/item[column/@name = "DEPARTMENT_ID" and column/text() = 10]/column[@name = "SAL"]') as "10"
department_id_xml, in the above code, is the name given by the Pivot XML operator to the XMLType column that it returns. Square brackets are used to filter nodes in XQuery. In the above code, item[column/@name = "DEPARTMENT_ID" and column/text() = 10] helps us find the item node which has a column node whose DEPARTMENT_ID has 10 as its value. 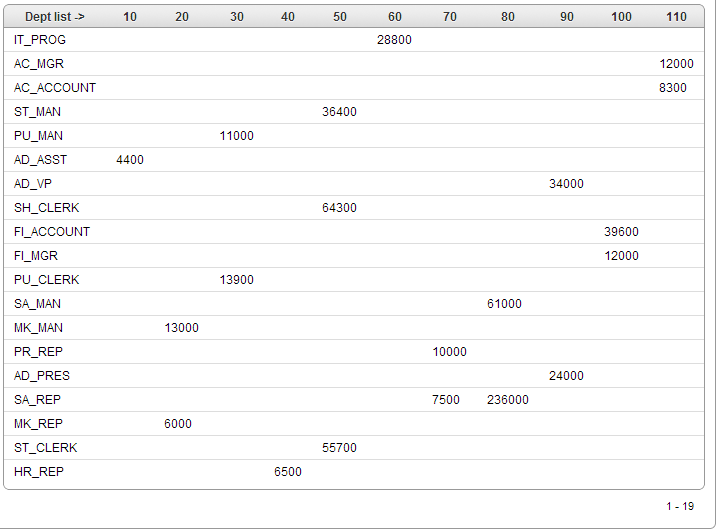 Clearly, the SAL column node of this item node will hold the value of the Salary for department id 10. Check https://apex.oracle.com/pls/apex/f?p=81782:5:0::::: to make more sense of the discussion. column[@name = "SAL"]') then displays the value of the SAL column node of the same item node. Hence this code gives us the sum of salaries of employees for a job id and department id=10 combination. The drawback of this approach is that you will have to create a column for all possible values that can possibly appear in the output. Read http://docs.oracle.com/cd/E11882_01/appdev.112/e23094/xdb_xquery.htm to know more about XDB and XQuery. Can you explain what version of Oracle 11g you are on? Note that I then had to strip these back out in the PL/SQL for Column Attributes. How exactly can we get the second set of columns for each department level total of commissions? Never Mind.. Had a dangling where in the select that was causing an issue, now able to get multiple sums in the pivot. Looking at the final issue of the page item to hold the in list item..
Quick question, how do you make this work for an interactive report? Sample code will remove all the pivot built columns at development time since the substitution variable is empty.. When did you move to Virgina? It will help if you can create an example in apex.oracle.com. I haven't worked on APEX in the last few months. I was working on OBIEE but will definitely check it out if you can create an example. Is it possible to have a Dynamic matrix report with editable fields?